These satellite images are processed from the polar-orbiting satellites operated by the US National Oceanic and Atmospheric Administration (NOAA) and National Aeronautics and Space Administration (NASA TERRA and AQUA). Satellite images from NASA TERRA are usually available in the morning between 0300 and 0430 UTC, while images from NASA AQUA and NOAA-19 are made available in the afternoon between 0700 and 0900 UTC. The path of each satellite orbit over the region is slightly different each day due to the earth’s rotation. As such, the satellite images on some days are only partial images. 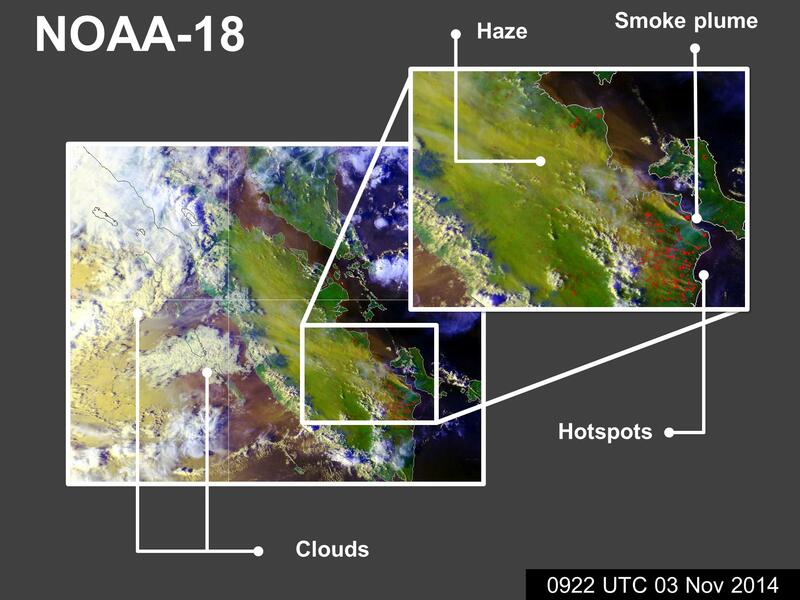 How do we detect land fires and smoke haze using satellite images and what are the limitations? Using this combination, hotspots are depicted in red, smoke plumes and haze in shades of yellow, and clouds in either white or blue-white. The colour assignment is not unique and various colour-to-channel combinations can be used which will result in the different features to be highlighted in a different colour. Land and vegetated surfaces are strongly reflective in the NIR (green) channel spectral band, thus appearing green in the above image. Clouds can be seen in both visible and LWIR spectral bands, whereas smoke haze is normally not discernable in the IR band owing to their respective radiative properties. Therefore clouds appear white or bluish-white as it is detected by all RGB channels; smoke haze and plumes appear in shades of yellow as it is detected by only visible (red) and NIR (green). The texture of clouds is also different from that of smoke haze. If the hotspot appears at the origin of a smoke plume, it is almost certain to be associated with an active fire. The smoke plumes will show a conical shape typical of fire emissions, with the vertex over the hot spots. Hot spots with no corresponding smoke plumes may be associated with very small scale fires or fires at the early stages of ignition. There are limitations to the detection of smoke haze and hotspots. Overlying clouds will invariably obscure areas with smoke haze and hotspots. In the presence of low clouds or fog, the smoke detection technique may not succeed and differences in the shape and texture between smoke and cloud/fog will need to be considered. Strong reflection of sunlight can also give rise to yellowish shades and these are not related to haze.